Sunset signs is your one-stop shop for all things business signs. You want to ensure thousands of new customers walk through the front door or visit the website, so you’ve opted for a building sign. 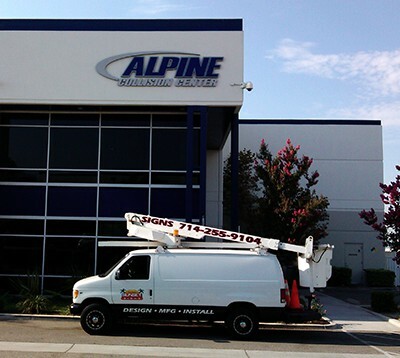 At Sunset Signs, we think this is a wise move because the right signage can do a lot. It can raise awareness of the brand to improve sales. Before we get onto removals and repairs, let’s walk you through the exterior and interior sign installation process. After all, it’s wise to understand how we work so you can choose a sign which works for all of your needs. The experience is simple: you call us or contact us through the website with an inquiry and we’ll get in touch. After speaking about your preferences, one of our C-45 electrical sign contractors will come to survey the target area. Once the formalities are out of the way, it’s onto the fitting. Don’t worry if it sounds technical because we do everything. We have the latest tools and equipment, including vehicles, to complete the job safely and to the highest standard. Sometimes, there is no need for a full replacement. Thanks to our 25 years of experience in the business, we are proud to be able to spot the difference between a repair and a replacement. Of course, the customer is the person who gets the final say and we are happy to offer our advice and let you make the final decision. If you do decide a repair is the best option, then we don’t only rely on our hands-on involvement and knowledge of the industry. Instead, we put faith in our state-of-the-art equipment which includes installation trucks and boom lifts. There aren’t any signs which are out of our grasp. 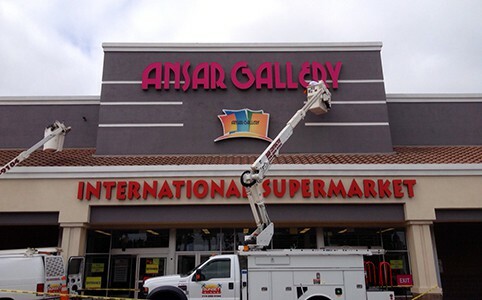 You don’t want a repair – you need a business sign removal service. Don’t fret because we have the right tools and the skilled employees to take care of your needs. Just tell us more about the sign – is it a pylon or an indoor LED? – and we’ll sort out the rest. That’s right; no hassle, no fuss. The reason we need to know about the type of sign is obvious in some cases, but it’s also safety related. Signage which lights up is an electricity risk and requires our electrical sign removal examination. Not only do we want to secure everybody’s health, but we don’t want to cause any more stoppages to your business than necessary. Because we remove our signs to spec, in the same way we put them up, we are confident we will be in and out in no time. – A Quality Service: We might not have put up the sign but we’ll will remove or repair it for you. This means you’ll get a quality level of customer service and standard of care that you didn’t receive previously. Not only that, but we aim to complete the job as quickly as possible and don’t hang around like other companies. We don’t want to charge you anything extra. – Cost Effective: Unlike other signage companies on the market, we don’t just aim to please: we deliver. So, the fact that you only have to pay us once for a job well done will save you a ton in the long-term. Not only that, but we are proud of the all American made signs that are produced right here in-house. Because we don’t cut corners outsourcing to foreign suppliers, there are no nasty add-ons. The price you are quoted is the one you will pay. – Health and Wellbeing: Never underestimate the dangers involved with removing signs. The smallest ones can turn out to be the riskiest to take down. It all depends on the materials included. Typically, there are more than one, and that adds to the level of danger. Our building sign removal team has the latest in technology as well as years of experience, so they’re qualified in safety. – Tools and Equipment: Speaking of our tools, the fact it’s the best on the market right now is important. Because skilled technicians operate it, it means everything is over and done with in one swoop.